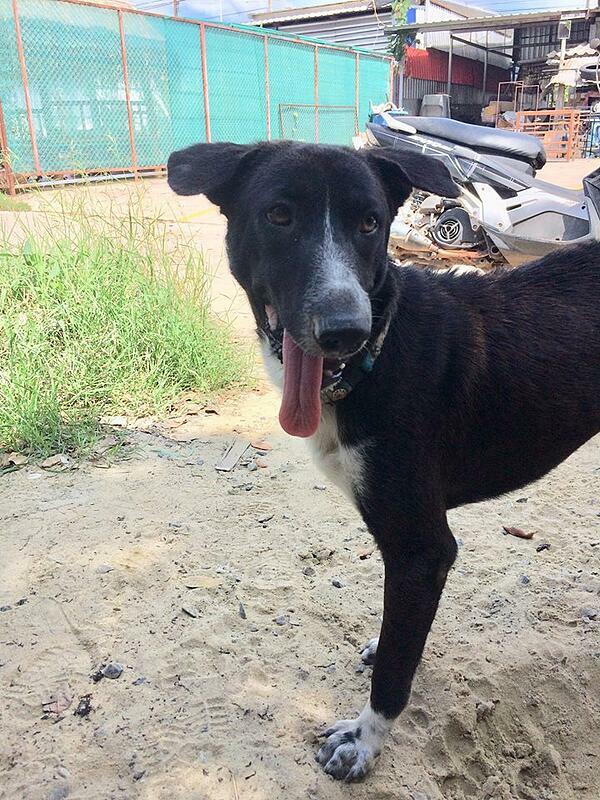 If you've ever traveled to Thailand, I'll bet you've ran into many stray dogs and cats ("soi" dogs and cats in Thai)... some more well off than others. Of course, stray and abandoned animals are no stranger to any country, but of all the places I've traveled to, Thailand has a big problem. This problem stems from several underlying issues. The first being lack of government funding and regulations. There aren't really any social programs in place to support these animals. Shelters or animal rescue centers are few and far between. If a city is lucky enough to have a shelter (likely started by a local or a foreigner), they rely solely on donations— the government doesn't offer monetary help. There also aren't any rules or regulations in place in terms of spaying or neutering animals. Breeders aren't regulated. The other issue stems partly from religion and partly from lack of education. The religious aspect is a touchy one, so I will try to tread lightly and explain what I've been told and what I've experienced. Thailand is a predominately Buddhist country. Many people who practice Buddhism believe in receiving merit for good deeds, so they'll often feed soi animals their leftovers. They also believe in reincarnation. Because of this, Thai people will not hurt or kill a stray animal because they fear that animal could be the reincarnated soul of their great uncle or second cousin, for example. For this reason, euthanizing animals is illegal, and many Thais are against spaying or neutering dogs and cats. Of course, by no means am I advocating for killing innocent dogs and cats, but if an animal is severely injured or is suffering from old age or disease, then the animal should have the option of being put down in the most humane way possible. What I don't understand though, is this: why is euthanizing animals illegal, but poisoning isn't? Or shooting? Or stoning? Street animals fall victim to these horrendous acts quite regularly, not just in our city, but all around Thailand. This is why I'm conflicted when religion is thrown into the ring. On top of this, there's a hole in information surrounding spaying and neutering animals. This is proven to not only cut down on over-population, but to also give the animals safer and healthier lives. Education around these issues— responsible treatment of animals, as well as the importance of spaying and neutering— is part of what we hope to work on in our city. Right now, there are two main shelters for stray dogs and cats in our city. One is quite small and is reserved for those who are sick and injured. 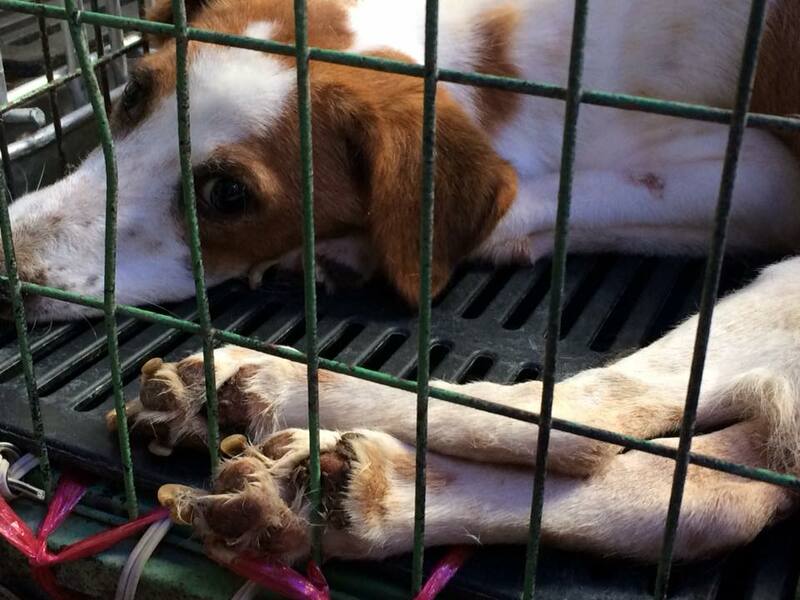 There are approximately 20 dogs and a few cats there, kept in individual cages. The other shelter is much larger and currently houses approximately 60 dogs. There are three main, fenced-in areas with several bamboo bungalows for the dogs to relax on. Two of these areas are full of healthy dogs, ready to be taken home. 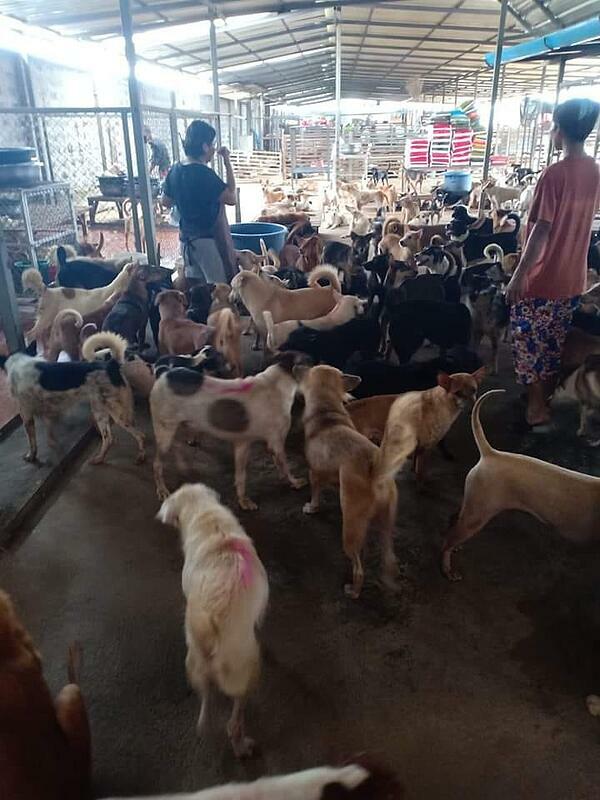 The third area is designated for disabled dogs, many of whom have gotten hit but busses, trains, and/or motorbikes, and are either missing limbs or have lost function in their back legs. This area is devastating to visit, but also incredibly heartwarming. 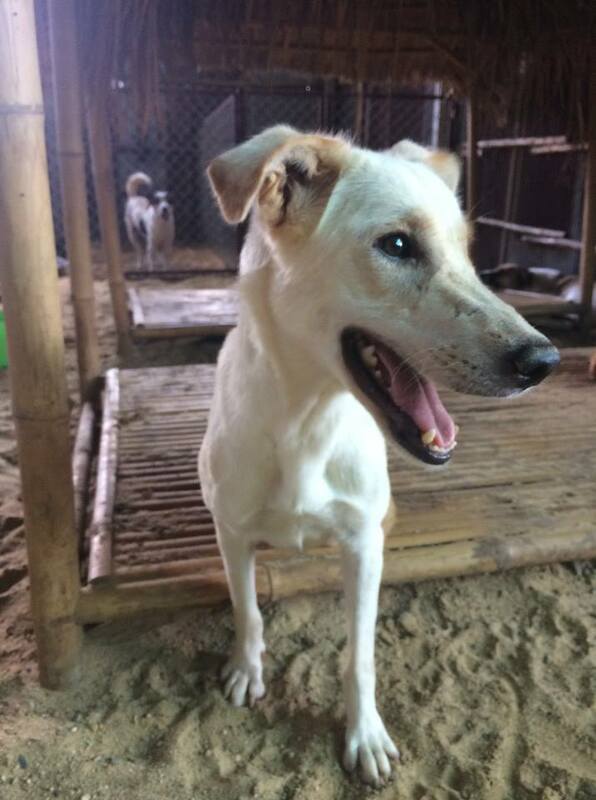 The disabled dogs are genuinely happy when we give them love and attention. The other parts of this shelter are full of individual cages where dogs are either kept alone or with another. This may be due to aggression toward other dogs or people, and/or disease or sickness. We try to visit them if we can. Two to three times a week, Justin and I will pay a visit to the second shelter, partly because it's much bigger and needs more help, and partly because it's less than a kilometer away from our apartment. If we've been lucky to receive any cash donations from colleagues or other people from our school, we will swing by the pet store on the way to pick up any food, treats, or medical supplies. Then, we'll drive to the shelter. Whenever we pull into the dirt parking lot, we're immediately greeted by tail wags and kisses from at least two friends— Summit, a street dog-Husky mix, and Floppy (pictured), a pup who's missing part of his jaw from a rough fight. 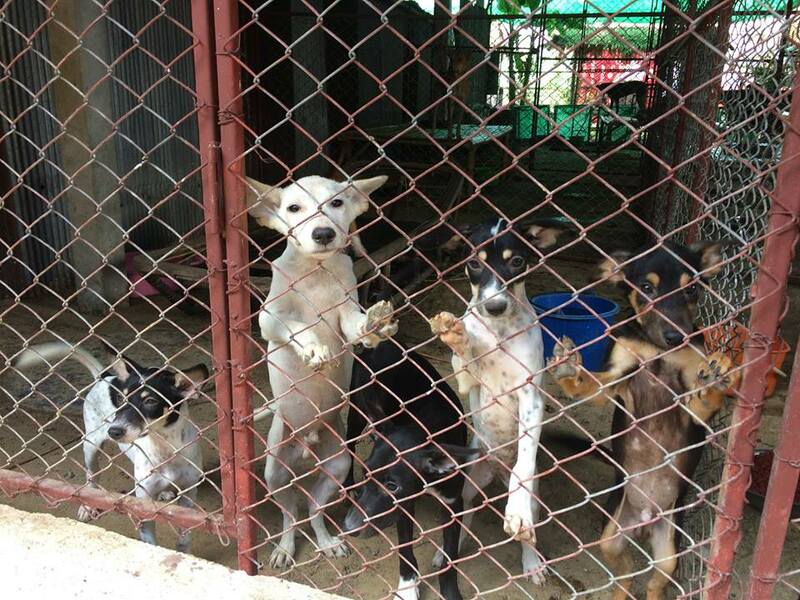 These dogs, along with a few others, live outside the shelter because the ones inside tend to pick on them. When we walk inside the first gate, we always say hello to our furry friends. Then, it's clean-up duty. We'll grab a few wooden brooms, dust pans, and bags, and walk around the different areas in the shelter to make sure they're clean. We'll also refill water and food buckets. Once our "work" is done, we make sure to leave extra time to pet and play with our handicapped friends. All the dogs need love, but these ones need it most. Aside from our volunteering, we work on promoting the shelters via social media. We've spearheaded the fundraising page, too, which you can find below. We also plan to work on a website to help particularly with adoptions. Justin and I do what we can, but the real credit goes to a local Thai woman named Parry who works tirelessly to keep the animals as safe and healthy as possible. Parry has a few local workers who help out at the larger shelter, but aside from that, she relies completely on volunteers to help with fundraising, food and medical donations, and adoptions. 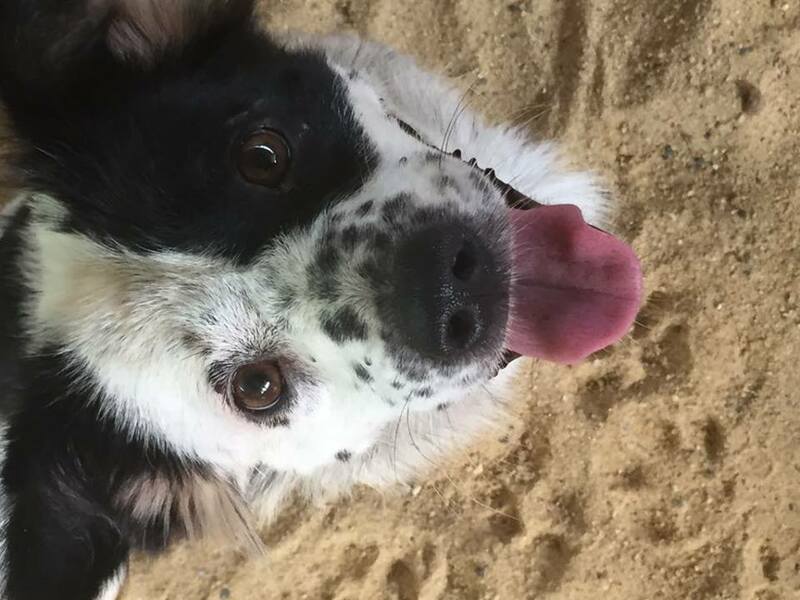 Her goals for the future are simple: continue fundraising, continue spreading awareness of responsible pet ownership and the importance of sterilization, and continue finding healthy animals good homes. 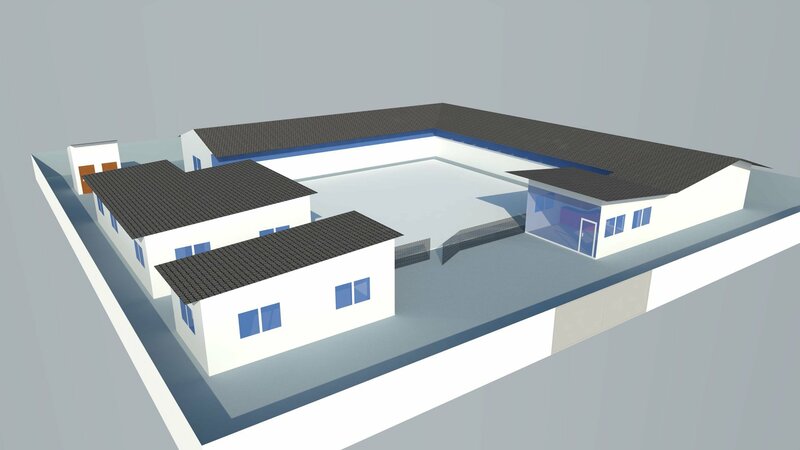 The ultimate goal is to build a new shelter in the Hua Thalae area of Korat (see mock-ups below). The shelter would be able to hold nearly 50-60 cats and 100-200 dogs. Plans include building a reception area, toilets, staff room, kitchen/store room and a small vet/wash room for sick pets. Since our fundraising campaign started at the end of September, we've been blown away by all the donations from our gracious family and friends. We thank you wholeheartedly, but the truly thankful ones are our furry friends. Even $5 goes a long way here in providing a month's worth of food, or even medical treatment. With over 23,000 Baht (about $700 USD) raised so far, we've come a long way, but we still have a long way to go. Please consider donating to our worthy cause. If anything, share our Facebook page and our fundraising page with your family, friends, co-workers, and neighbors! Spread the good word! Let's work together to help the animals in Korat, Thailand. As we like to say at K9 Rescue Korat, "Many licks and tail wags from all of us!"